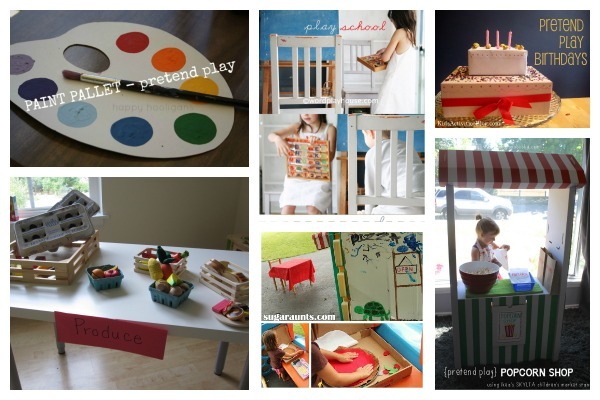 Pretend play... Dramatic play... Dress up... whatever name you want to call it, is so important in nurturing the creativity of children and in helping them to explore the world around them. There are so many important ways that pretend play helps kids and even more ways that this type of play can be encourage in children. 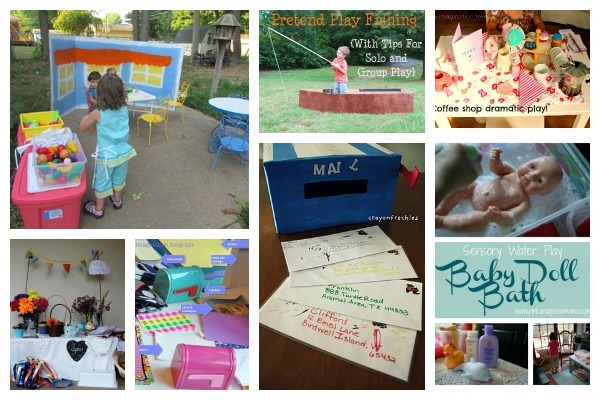 Here are 25 super fun ways I've found to inspire pretend play at home and in the classroom. 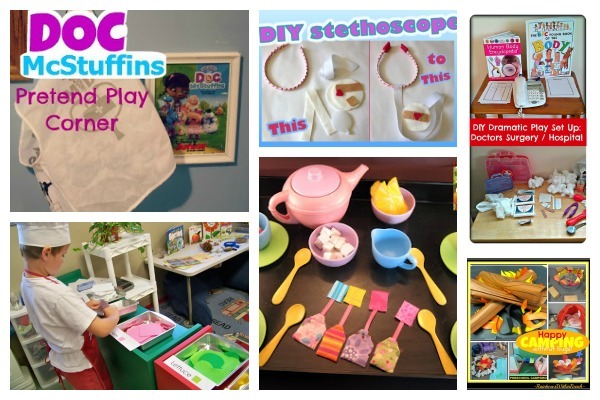 Create a pretend play Doc McStuffins clinic for your little fixit fan. Keep the Doc McStuffins play going this felt stethoscope tutorial from American Felt & Craft. Add some realism to a pretend tea party with diy tea party accessories like The Artful Child did. Set up an indoor campsite like Rainbows Within Reach did. 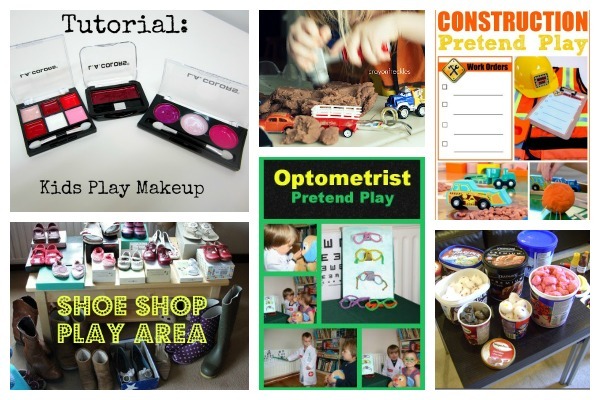 Create pretend play makeup with this tutorial from 4Eighteen. Start building the fun with these construction pretend play props. Set your sight on fun with this pretend optician's office from Crystal's Tiny Treasures. Set up a pretend ice cream shop using this easy tutorial from Life is a Party. Don't let the calendar stop the birthday fun using this pretend play birthday party idea from Kids Activities Blog. A grocery store pretend play center is a great way to talk about healthy eating, as No Time for Flashcards points out. Add a taste of Italy to pretend play with this homemade felt pizza from Sugar Aunts. Pop up some fun with a pretend play popcorn stand like this one from Mama Papa Bubba. Take the play outside like Teach Preschool did and create an outdoor café for dramatic play. Let your kids catch their own fun with this pretend play fishing idea from Childhood Beckons. Create a pretend play coffee shop that offers all the fun and none of the caffeine like The Imagination Tree did. Get your Post Office stocked and ready by creating this mailbox and play-friendly letters. Have some water fun washing baby dolls like Pink and Green Mama suggests. 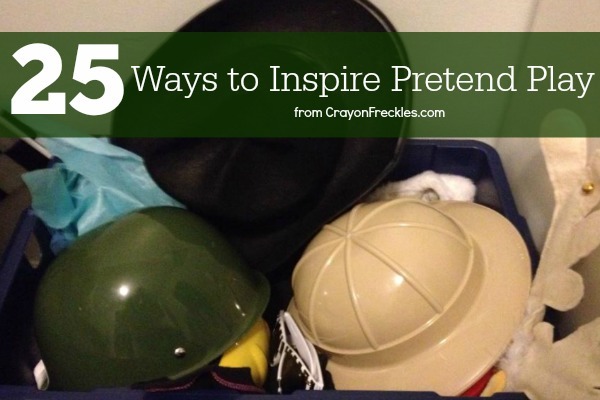 What are some of your favorite ways to encourage or support pretend play with your children?